Thank you to the many partners that help Lake Forest and Lake Bluff libraries make Deep Freeze Read possible! Lake Bluff Public Library is a suburban library that has served the Village of Lake Bluff since 1919. Our mission is to act as a vibrant community center that provides materials and services to enhance individual knowledge, offer personal enjoyment, expand technological resources, and facilitate civic interaction. Lake Forest Library is located in Lake Forest, Illinois, a community located thirty miles north of Chicago on Lake Michigan. 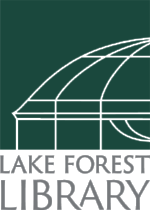 Lake Forest was founded in 1861 and developed under the leadership of Lake Forest College (then Lind University) and the Presbyterian Church. Gorton Community Center is one of only a few privately-funded community centers in the United States and serves as a unique partnership between community volunteers and the City of Lake Forest.